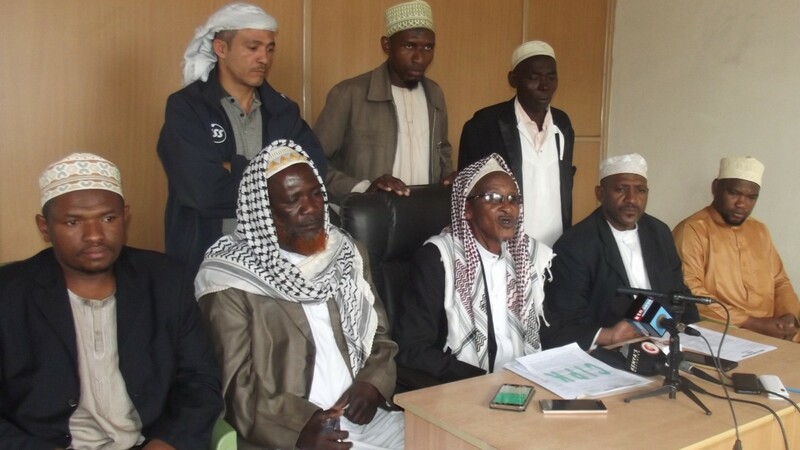 Home MTAANI NEWS Muslims tell off Raila, pledge to support President Uhuru Kenyatta. Muslims tell off Raila, pledge to support President Uhuru Kenyatta. Imam Al Haji Shaban Gakere Bakari (centre), reads a statement on behalf of the Mt. Kenya CIPK region and the Muslim community where they dismissed Raila Odinga's rejections of the poll results. The Council of Imams & Preachers of Kenya (CIPK) Mt. Kenya Region has dismissed allegations by NASA leader Raila Odinga accusing the IEBC of rigging the August 8 election in favour of the Jubilee government. The imams, led by the Mt. Kenya Regional Coordinator Al Haji Shaban Gakere Bakari, Kiambu CIPK Chairman Shuhaib Mohammed, Murang’a Chair Awadh Ali and his Nyeri counterpart Jamil Hamil Hamza reminded Raila that one key pillar of democracy was to accept ‘unconditionally’ the results of a free, fair, transparent and credible election. Speaking at Majengo Mosque Thika, the religious leaders affirmed their support for President Uhuru Kenyatta and his deputy William Ruto and assured them of the Muslim support as they embarked on their second term in office. The imams pleaded with the NASA fraternity to reconsider their hardline stance of rejecting the results of the just concluded elections which, according to them, had been endorsed by both local and international observers. “We appeal to Hon. Raila Odinga to embrace the olive branch extended to him by His Excellency Uhuru Muigai Kenyatta during his acceptance speech upon being declared winner by the IEBC. We also call on all NASA supporters to refrain from any acts of violence for it will and has never borne any positive results in the prevailing circumstances in the past,” read the statement by the imams. Imam Bakari said that going by the current state of events by the NASA leader, Hon. Raila was bound to dent his rich history in the second liberation of this country. “We do recognise the immense contribution made by Hon Raila towards shaping the high standards of democracy that Kenyans are enjoying today. But the more than 6 million voters who voted for him (in the just concluded polls) should not be used as a tool of making unconstitutional moves. The end of an era is the beginning of another,” said Bakari. Awadh Ali appealed to the NASA brigade to accept the results otherwise, if they felt aggrieved, they should simply take their grievances to court. “The Kenyan people are tired of demonstrations and protests. If they must demonstrate, we will only urge them to do so peacefully and not infringe on the rights of the other Kenyans,” he said. Hamza reminded those opposing the outcome of the election that Kenya was one and chaos would only disrupt everything they have built over the years. On his part, Shuhaib reminded Hon. Raila Odinga that the nation could only have one president at a time and it was only good for him and his legacy to accept defeat and join hands with other Kenyans in nation building. He appealed to the police to exercise restraint when dealing with the demonstrators and only use force according to what is prescribed by law.